short girl, long island. : Kouture: Taking Fashion to a Whole New Level. Kouture: Taking Fashion to a Whole New Level. As I've mentioned in the past, I am a huge fan of Instagram. If you are unfamiliar with Instagram, it is an app that you can use to edit and share photos. You can use hashtags for pictures, so they can be searched by users in the Instagram community. I have befriended lots of people, over shared interests. One of those people is Kiley Miltsch. Last year, I came across her Instagram account, and she had this awesome dress I inquired about. She answered me promptly, and was super nice. You can choose who to follow on Instagram, so I decided to add her. I'm glad I did, because she has great fashion sense and family is very important to her, which I think is really cool. I found out a few months back that she will be opening her very own store, Kouture, in her hometown of Rochester, New York. Kouture will also have an online store, which will carry all of the goodies at the flagship store. Some of the brands Kiley will be carrying are House of Harlow, Jeffrey Campbell, Paige Premium Denim, and UNIF - just to name a few. I asked Kiley to connect with our readers, to let them know a little bit about the girl behind Kouture. Hi, Kiley! Tell the readers a little bit about yourself. I’m a 20-year-old entrepreneur and fashionista from Rochester, NY. I’m also a fashion blogger and the founder of Kouture, a women’s boutique. Kouture is my brain child and I’ve been working on for almost 2 years now. The first store is opening Spring 2012 in Rochester, New York, and the online store will also launch then. I consider myself an artist, and fashion is my outlet. I’m a very laid-back person, but when it comes to my outfit choices, I’m always over the top. When did you realize you wanted to work within the world of fashion? I started working at a store called L’Avant Garbe when I turned 15. I used to go in there all the time when I was in middle school and asked the owner, Lori, for a job when I was only in 6th grade. It was something I always knew I wanted to do. I remember she called me on a Friday night when I was a sophomore in high school and I started working the next morning. Lori took me on my first buying trip to Coterie when I was 18, and that’s when it really set in that this was going to be my career. I was so lucky to be given that opportunity. Kylie's Coterie buying trip, stocking the shelves of Kouture! How old were you when you decided that you wanted to open your own boutique? To be honest, I never thought about having my own store because LVG was my main focus, but I think Lori always knew I was destined to follow in her footsteps. Lori moved to France and closed the doors of LVG in 2009 and that was when the whole idea of “Kouture” was born. This dream took how many years to become a reality? Well, LVG closed in September of ’09, and we have been developing Kouture since then, so it’s been about a year and a half of planning. Family is an important part of your life – your Instagram is always featuring many members of your family, which I love. How does your family inspire you? I love that we have never met in person, yet you know how important family is to me. My dad’s work ethic is unreal. He was raised in a strict German household, growing up where hard work was expected. He has taught me that nothing will happen without hard work, it’s definitely inspiring. My nieces are my biggest motivation. Being able to provide them with a future is ultimately what I’m working for. I always have believed that everything happens for a reason and I was blessed with four nieces, if that’s not the next generation of Kouture… I don’t know what is!! Kiley's niece, Molly, is already a budding fashionista! Lets get down to some fashion questions! What are some signature pieces in your wardrobe? All of my shoes! I’m addicted to Jeffrey Campbell. Shoes are such a staple piece of any outfit. You can be wearing just jeans and a white t-shirt but if you have killer heels on, it’s automatically stylish. 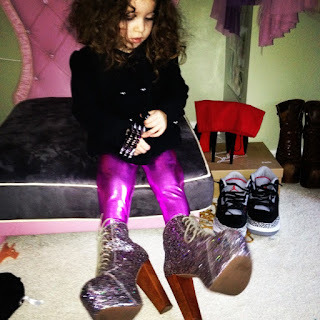 My 2-year-old niece has already claimed all of my shoes for when she gets bigger, she’s too funny. Right now… Jeffrey Campbell, UNIF, Style Stalker, Ivan Grundahl, MINKPINK, and Wildfox. I’m also a huge fan of ACNE and Opening Ceremony. What trends do you think are going to be big for 2012? What about for 2013? This whole 90’s grunge look is big right now. Spikes, studs, American flags, ripped pieces, leather… its everywhere and its not stopping. I recently started ordering for fall 2012 and its still going strong. I’ll have to wait until the next Coterie to see what will trend for 2013. It’s hard to tell, the fashion scene is always changing. WEALTH photo shoot, styled by Kiley. What are some versatile pieces you think every girl should have in her closet? Every girl needs a pair of American Apparel black disco pants, a pair of Lita’s, a badass leather jacket, and a nice bag. Basics are important. A dress that can transition from night to day is always a great piece to own. I recently just purchased a long sleeved black dress by For Love and Lemons and I’ve been living it. Any wardrobe tips for the gentlemen? I can’t tell you how many people ask me about this, and my answer is always the same: I know nothing about men’s clothes! The only tip I have is to not match your hat, shirt, and shoes. That might be the worst look EVER. If you could style one person of your choice, who would it be? What would you choose for them? Kreayshawn! I love her style, it’s so different than anything I’ve ever seen, and she gives me a lot of inspiration. The best part about her style is that it’s effortless. She’s described herself as a “90’s teeny bopper in London from the hood” (haha). She’s cool. I’d love to dress her in UNIF. She’s anti-stylist, which I respect, so I don’t know if styling Kreayshawn would ever happen, but maybe I can be her personal shopper. I’d love to send her some goodies from Kouture and let her style it. Besides selling wearable works of art, do you think that you will ever start your own line? Absolutely! Not any time soon though, maybe once Kouture is established and I have some extra time. You are a go-getter, so I bet you already have something else up your sleeve – what is the next step for you? That’s a compliment, thank you. The next step is to get the doors open in Rochester and build my online store into something big. And after that, expand Kouture into other major cities. Rochester is just the beginning, it’s a starting point and a platform to build off of. I hope people can really understand that Kouture is going to be so much more than just a store. It’s a lifestyle. Where do you see yourself and Kouture, five years from now? I have big dreams. I see myself living in Rochester still because I could never live away from my nieces but doing a lot of traveling. I’d like to see myself growing the “Kiley Kouture” brand and doing personal shopping/styling for some big names. Hopefully there will be a few Kouture stores starting to pop up and I can expand to the West coast. I have my eyes on LA. Maybe I’ll have a big warehouse space for shopkouture.com. Anything is possible with drive and motivation. A bit off-topic, but I know that music is a great motivator for most of the people I speak with, and I’m sure Kouture will always be boasting a killer soundtrack. Choose ten songs to make a mini Kouture playlist for our readers. I can't wait for Kouture to open - Kiley has been working diligently, and I love to see my friends succeed! Venture over to the Kouture website, and make sure you check out Kiley's blog. If you're on Instagram, you can Kiley under the name KileyKouture. If you dig the songs Kiley chose, I made a playlist on Spotify, which you can snag here. Love her style! Awesome post! Yeah, Kiley is fantastic! I'll be posting more as the store opening gets closer - I've seen some of the pieces she will have when the store opens, and they're fantastic! A Little Tuneage To Get You Through The Weekend. Goodies From Edition 01 + 50% Off Coupon Code! Bloggers for Health: Facing Challenges. Acure Organics to the Rescue. Hello Cavities Giveaway Ends Tonight! Baby Steps to Better Health. Productivity at Three in the Morning. Childhood Crushes and Davy Jones.